What does “green” mean for commercial roofing? 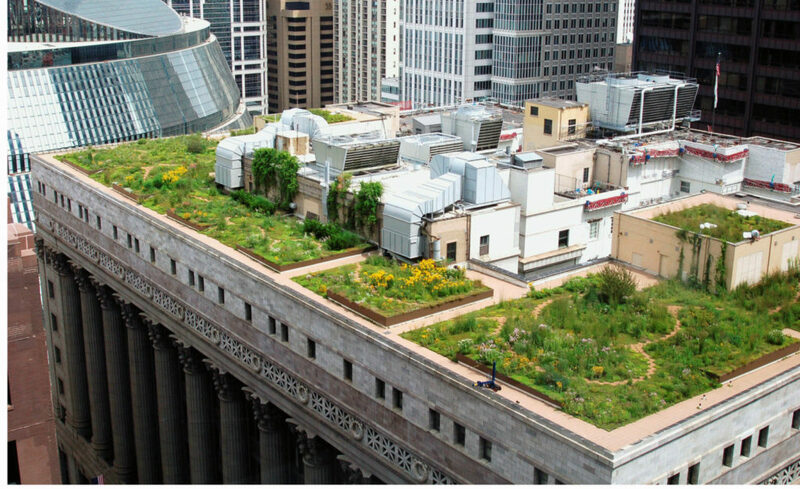 ‘Green’ roofing is a concept roofers have been practicing for years. It’s a way we can all work together to conserve energy, save money and help the environment at the same time. Conventional commercial roof systems absorb heat from the sun. The absorbed heat enters the building and causes the air conditioning to run more frequently and use more energy. By using energy efficient materials and the correct installation method, saving energy can be realized in hundreds to thousands of dollars each year. It is important to understand the various terms and concepts associated with green, energy efficient roofing systems. Single Ply materials (GAF TPO & IB PVC) TPO, Single Ply Membranes, is a flexible plastic material that does not contain chlorine or plasticizers. Because of the absence of chlorine, it can be classified as an environmentally safe ‘green’ product as well as being 100% recyclable. TPO is also flame retardant and has a reflective rating in the high .75 and when tested again after 3 years, still maintains a rating in the lower .70. It allows the cool air to stay in the building during summer and heat in the winter, keeping your energy consumption and bill payment down. TPO roofing materials come in wide sheets and are seamed together with hot air. An amazing benefit of TPO is that after the seams are heatwelded, it becomes stronger that the roofing material itself, it locks out any potential leaks. And since they are installed as wide sheets, labor time is reduced resulting in cost savings. Heat absorbs differently based on the roofing system. Temperatures of four different type of roofing systems were tested (based on a single summer day of 90 degrees). The results clearly show hot asphalt absorbs the most heat and TPO or Thermal Plastic Roof absorbs the least. R-value measures the resistance of heat flow. The higher the R-value, the more the insulation will resist heat. Insulation is a key component to all types of roofing systems including metal. It keeps the heat or cold inside your building where it belongs. Learn more about it with insulation from Nationwide Foam, Inc.
Tax Benefits are the government’s way of helping us to achieve green. Keep up to date on the latest tax benefits by asking your accountant or visiting the government website. A Modular Tray System is a green roofing solution that can be easily adjusted and rearranged after installation. Because of this, roof maintenance and repairs are easy to do.